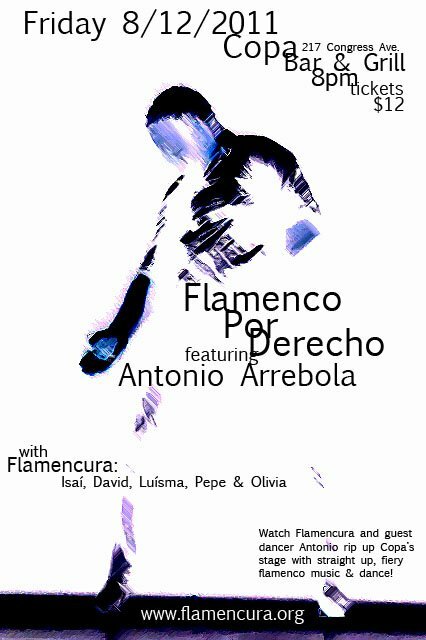 Home » Portfolio » Antonio Arrebola with Flamencura at Copa! Antonio Arrebola with Flamencura at Copa! Antonio Arrebola performs with Flamencura at Copa Bar and Grill, 217 Congress Ave. Don’t miss the fireworks as Antonio rips up the stage, accompanied by Isaí Chacón (vocals, guitar), David Córdoba (guitar), Luisma Ramos (guitar), and dancer Olivia Chacón! 8pm, doors open 7:30. $12. Tickets at the door. Stay for salsa dancing after the show!